Syrian President Bashar Assad prepared to announce today a partial withdrawal of troops from Lebanon. He will deliver a speech this afternoon, in the parliament, on Syria's current political developments, said the official SANA news agency. However, President Bush said Friday that only a full pullout of Syria's 15,000 troops and intelligence agents would meet Washington's demands. Washington and other Western powers were said to be preparing to impose sanctions and to call on the United Nations to approve tougher measures if Syria fails to pull out entirely. British Foreign Secretary Jack Straw ruled out the possibility of any military attack on Syria. After 'occupying' Lebanon for decades with the quiet approval of neighbouring Arab leaders, Bachar Al-Assad found himself isolated and rejected on Friday, when the leaders of Saudi Arabia and Egypt told him frankly, for the first time, to give in to international demands to withdraw immediately. So have France and Russia, longtime allies and patrons of Damascus. The media and several analysists said that Syrian leader, isolated abroad, must weigh costs of pulling troops. The crisis may serve as a defining test for the leader. A retreat from Lebanon means stripping his country of its most important strategic asset along with a chunk of its pride. Leaving Lebanon also means Syria's swallowing defeat before Israel. Several analysis also indicated that Syria still nurture the hope of regaining the Golan Heights, a scenic stretch of mountains lost to Israel in 1967. But without Lebanon, Syria won't have much to trade for the land. Analysis also said that the best Syria can do is offer to rein in the Syrian-backed Hezbollah guerrillas on Lebanon's southern border, who launch periodic attacks on Israel. Syrian troops first entered Lebanon in 1976. They were backed by the Arab League as a peacekeeping force in the country's civil war. When the civil war ended in 1990, some 15,000 troops and thousands of intelligence personnel remained. UN Security Council members have been considering measures against Syria since issuing a resolution in September 2004 calling for all foreign forces to quit Lebanon. The chorus calling on Syria to quit Lebanon is growing louder. Bashar Al-Asad is in a difficult choice: whether to stay in Lebanon, or delays the Syrian departure. If he fails to comply with the Taif Agreement, his country could face sanctions and other forms of ostracism from the US and the International community. The world today will be watching him closely when he speaks to his country's parliament about the Lebanese-Syrian crisis. After the killing of Al-Hariri, Syria is no longer welcomed in Lebanon. 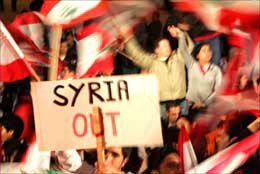 This is reflected in the continious protesting crowds in Lebanon, demanding the Syrian troops and intelligence to quit their country. Lebanese public will and power made the pro-Syrian government to resign. Angered, Lebanese call in loud voice "No more occupation, Syria Out".